Doha (VNA) – Vietnam is Kazakhstan’s important partner in Southeast Asia, affirmed Chairman of the Mazhilis (lower house) of the Parliament of Kazakhstan Nurlan Nigmatulin. He made the affirmation at his meeting with Chairwoman of the National Assembly of Vietnam Nguyen Thi Kim Ngan in Doha, Qatar, on April 8, on the sidelines of the 140th Assembly of the Inter-Parliamentary Union (IPU). 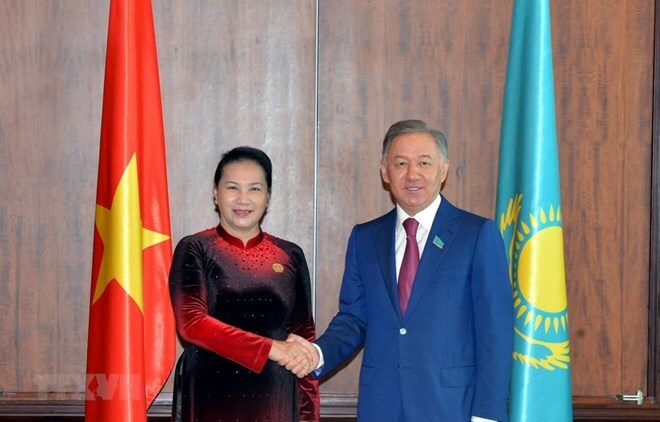 He said Kazakhstan is interested in boosting parliamentary cooperation with the National Assembly of Vietnam, while informing that he plans to make an official visit to Vietnam at the invitation of Chairwoman Ngan at the end of this year. The two countries conducted dialogues to step up their cooperation over the past time as 2019 marks the 27th anniversary of bilateral diplomatic ties, he noted. Congratulating Kazakhstan on its successful election, Ngan said she is delighted that the country’s new leaders asserted their viewpoint of enhancing the cooperation with Vietnam. She briefed the Kazakh leader on Vietnam’s socio-economic performance in 2018 and the country’s hosting of the second Summit between the US and the Democratic People’s Republic of Korea, saying Vietnam and the National Assembly are keen on cooperation priorities with Kazakhstan. The leaders shared their joy that the bilateral political ties are growing, but pointed out that trade remains modest, failing to explore the respective potential and meet expectations. As a direct air route between the two countries is still absent, Ngan suggested boosting aviation cooperation along with assessing the results of the implementation of Vietnam-Eurasian Economic Union Free Trade Agreement for making the best use of the deal. She also suggested the organization of a Vietnam-Kazakhstan economic forum, exhibitions and fairs during the upcoming visit by Chairman Nurlan Nigmatulin for businesspeople to seek more cooperation opportunities. Chairman Nurlan Nigmatulin said he will relay the proposal on aviation cooperation to the Kazakh Government as the cooperation would help create a new momentum for the two countries’ trade-economic partnership. He suggested the economic forum be organized in both countries, asserting that the lower house of the Parliament will support the two governments in the issue. The leader expressed his hope that Kazakhstan and Vietnam would sign a memorandum of understanding or a cooperation agreement to step up parliamentary cooperation during his upcoming Vietnam visit.